Hi Faye! Tell us a little bit about yourself. Hi...oddly a tough question to answer....hmmm. I am a mother, a partner, a shoemaker, a general world ponderer. I am a woman molded by necessity and chance. I grew up in a beach town in Los Angeles always working in the wood shop. Then went to Berkeley to study film, NYU for graduate school, but ended up spending about 18 years doing wardrobe for movies. In wardrobe, you get to work with such inventive makers who go from making grand things for supernatural worlds to recreating period apparel to exacting degrees. I've worked with shoemakers, milliners, armor makers, couturiers, but also shoppers and trend setting stylists. My father also works with leather and has had a bag factory for decades. So I would say the influence to make was always around me. What drew you to wanting to create shoes? While working in film, many people would ask me for career advice. I always said that unless you were making, then you only had a talent, not a skill and skills were necessary to stay relevant. Wardrobe can be quite cut throat that way, age can make you dispensable. I saw the custom shoemakers I worked with in film slowly passing on with no one inheriting their knowledge, so I always recommended this to people as a skill to learn. But no one ever took my advice! So one day, I happened to walk into a shoemakers shop in Barcelona and convinced the guy to teach me so I could practice what I preach! 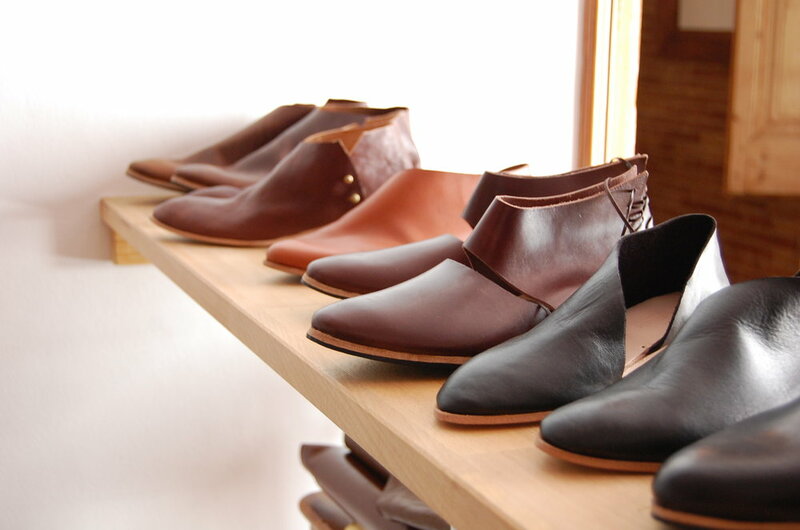 After learning how to work with leather and craft shoes, how long did it take you to start your business Sevilla Smith? My background in film really helped push me to work quickly. You get used to going from 0 to 100 in that industry. So I arrived back to Philadelphia from Barcelona and wrote a business plan based on research I was doing while I was learning. Plan and budget were done in days, then I made myself make 50 shoes in 50 days. It was absolutely brutal and my body was so sore! But at the end that push, that was it! I opened shop with photos of shoes I had done the next day. How do you source your materials and what goes into the creation of one of your designs? I try to be very disciplined in both sourcing and design. I source most all my leathers in Europe because it is easier for me to be assured of how they are made since they have stricter regulations. Even our soling leather and the leather that makes the stacked heel are tanned in Spain and Italy with European steer. I tend to find natural imperfections more beautiful, so this tends to dictate what I pick sometimes when I am going through hides. But the fantastic thing about making to order, is that even if I only find enough leather to make 3 pairs of shoes, I can go ahead and offer that to our customers. Imagine, a shoe that only 3 were made...it is quite special. The craft of shoemaking is a beautiful rabbit hole that can really over complicate or work against comfort so I try to be very disciplined about the design. I have a couple rules that all our shoes are made by: no thermoplastic stiffeners and no stitching. These 2 things can stop the leather from stretching to accommodate your foot, so I avoid them in all our shoes. These 2 things alone actually limit so many new designs that I would love to make, but I keep designing with these rules every week anyways to see what works. You recently launched a line of bags; what made you want to create bags as well? My dad is a bag maker in the Philippines, so it was inevitable. This is a project hatched out of doing something between my dad, my sister, and myself. But I found after a year of development that I needed to be closer to where the leather was coming from. So I ended up with doing the cutting process in Barcelona with a local maker. The bag was actually a fairly long design and concept process. It took about a year to think about the design...for 1 bag! But I wanted to make sure it was relevant to the shoemaking process. So I ended up with a bag that has been lasted and molded to have a hard bottom like a shoe, but folded into a really soft shape. Do you have a customer in mind when you are creating your pieces? Absolutely. Ironically, the customer I have in mind doesn't actually like to buy anything. They try to have a spare consumer footprint. They like to be comfortable. They like to travel, so their purchases need to fit into many different scenarios. They explore, and don't want their shoes to be a hindrance. I would say that historical footwear of non bourgeois people is where I find the most inspiration by far. Those were times that people only owned 1 or 2 pair of shoes and they wore them everywhere. They walked a ton. The shoes were made sparingly and had to work for many types of people. You spend a lot of your time traveling. Would you share some of your most memorable travels or moments? My absolute favorite memories have actually involved other shoemakers around the world. It's like a secret group and they have let me join in! In Marrakech, I went into so many little workshops with my son. Most were so spare, even more so than my own workshop which is pretty simple. They would have a stool on the floor, a wooden stick, maybe a hammer and some scissors...and a tree stump like me! It was so great talking to the shoemakers about how mostly women (all women but 1) make our shoes (they say it is not common there). My son was so proud and at the same time so confused! I met shoemakers in Greek islands who waved their big city life goodbye for a simpler, happier existence. I met people in Portugal who made clogs for fishermen (who knew!) and started with a block of wood and a knife. Makers have such great potential to make up a bigger slice of the consumption pie, so I get so excited about all makers. For shoes, I am always excited about what I see from Love Jules Leather, Cobra Rock, Aldanado y Fernandez, and Rachel Sees Snails. They have such a great handle on the craft of shoemaking and they have an aesthetic vision that isn't dictated by trends. Like I said, us makers have the immense potential to carve out a bigger slice of the consumer pie. But it is not just about sending dollars from one mega brand to a micro brand. Each maker I know of has a vision and a value system that they try to live by and that they build their brand on. We have spent so long ignoring the values of mega companies and let ourselves get lulled by glossy advertising. But in truth, so many are so ugly behind the scenes. Meanwhile, small and local makers each have workshops and people behind them that I want to spend time with and be happy to spend time in. And when we spend money with them, it is not another line item on some spreadsheet, but it's violin classes for kids, it's a babysitter for date night, it's money into what makes life beautiful. But also, look at who many of the makers for the things women buy are... it is so many other women! How fantastic is that?! It is moms working out of their homes, it is women starting new businesses as their own bosses, it is women being beautiful, sentimental, business owners with vision rooted in our experiences. I hope we support more of that. I want handmade and made to order shoes to be common again. I don't want it to be financially out of reach but I also want to pay our shoemakers fairly, so I need to make sure that our shoes are worth foregoing 3-4 factory mall shoes. I want people to go handmade whether they are in my shoes or not, so I always share other makers in my own social media. Once people have handmade shoes, I believe it is nearly impossible to accept the value of a factory mass produced brand. What are some of the setbacks or challenges you face with your brand? The biggest setback has been with knowing which shoemakers to work with. It is important for every one of our shoemakers to have dreams and I love supporting that. But for some shoemakers, it can be painful to be working on someone else's design or to break some shoemaking traditions (which are largely established by classic English shoemaking for men). My shoes are made very specifically and differently, so when a shoemaker is so entrenched in tradition that they can't adjust to how our shoes are made, it has gotten really problematic and was a huge financial loss. But shoemaking attracts very traditional personalities, it is one of it's beauties after all....so I just have to be more mindful. But it opened my eyes to seeing non-shoemakers as being wonderfully trainable. So our lead shoemaker now was actually our babysitter retrained! The biggest challenge is retraining how people think of their shoes. We are so used to beautiful, but stiff shoes. Our sizes are not based on measurements anymore, but on how to be comfortable in shoes that have stiffeners. So we try to make sure people understand how shoes that are meant to stretch should be very snug, but it's difficult when 99% of shoes they've encountered are not meant to really stretch. If we don't support each other what do our children learn about what women can do? I am fairly doom and gloom about the patriarchy in my generation, but I am so hopeful for the young ones. Liz Pape of Elizabeth Suzann for sure! I think she also exercises a lot of restraint in her design and it makes it easier for many women to express themselves in her clothes. Her design isn't about her, it really is about the wearer. That is oddly inspiring. Liz has also really raised the bar for what brands/makers can and should do in business. The impact of her words is felt exponentially and I get really excited about that. Her transparency and far sightedness is contagious. I have been collaborating with her since I first opened shop, so much of how Sevilla Smith is now actually comes from her inspiration. But most people already know about her impact...so other brands/makers.... I love Keiko at Brooklyn Shoe Space (who btw also makes shoes for us sometimes). She has channeled so much of her creativity and knowledge into teaching and sharing the craft of shoemaking with other people. I find Cary and Jenna at Ace and Jig inspiring because of their energy level. They bring such happiness and energy into their brand and it's apparent from their social media all the way to their textile design. It's wonderful to see. Instagram has been my biggest platform for sharing my work, but it is no easy animal to tame. I look at our analytics constantly to try to figure out how best to use it, but I really still have no idea. Travel is both tool and resource for me. Most don't think it would be necessary for running a business, but I find it critical to mine. I test drove my shoes for an over 100 mile walk thru all sorts of terrain and it helped me immensely on staying with my vision for my shoes. If one had to live with just a spare, small bag while traveling for 2 weeks, would the things one makes earn that bag real estate? Those questions get asked of my product all the time, I (selfishly) feel the need to do it also. Other shoemakers have been wonderful with sharing resources. I find as a micro business, that it is important for us to combine our purchasing power sometimes to get the best materials for a decent price. Other makers shouldn't be seen as competition, but as comrades in going forward as a viable business. What are some of your favorite places in Philadelphia and Barcelona? For Barcelona, I love living in Ciutat Vella, the very old part of town. The best thing I recommend for people to do here is to get lost. Be as lost as possible and you will find so many beautiful shops, restaurants, and little historical spots. Planning, and reading all those guidebooks, will actually just bring you to where all the masses are and destroy the beauty of Barcelona. So get lost and you will find tons of makers here. Just the other day I found a guitar maker just a 3 minute walk from my house that I had never seen before! Some good spots are Lantoki for a collection and workshop of several local makers, the avarcas shoe spot on Avinyo, Banys Vells (the street where I learned to make shoes) has many makers as well. I have also bought paintings for a steal by buying directly from the painters who can be found hanging out with each other outside Santa Maria del Pi. I also love going up to Tibidabo, it's an amazing old school amusement park with the most gorgeous view of the city. It has a beautiful cathedral as well. Mercantic Sant Cugat just an easy 20min train ride is fantastic to see an entire market dedicated to vintage home things, they have food trucks, and sometimes, a band. In Philadelphia, I love all the little BYOB restaurants. Most are tiny and take only cash, and the food can be outstanding. My favorite is Audrey Claire or a tiny sushi spot on Sansom called Vic. I am always in awe shopping from the Amish in Reading Market. I love going to the Italian Market on the weekends.